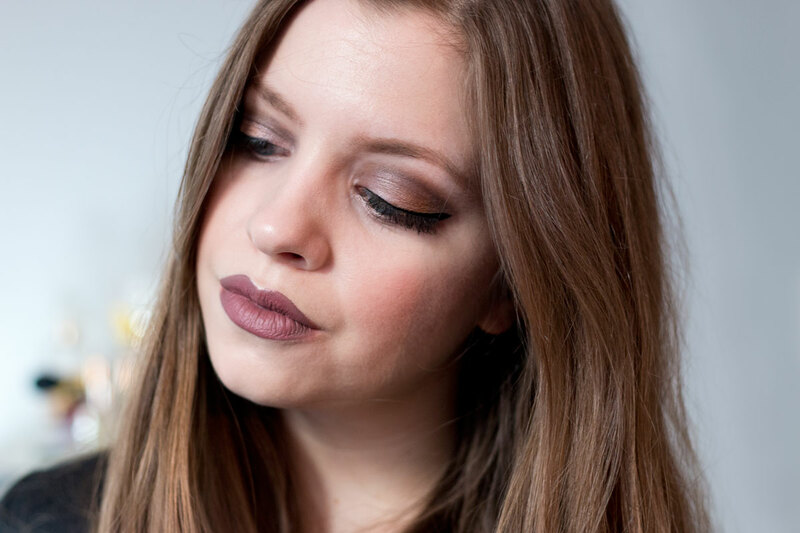 I’m so used to seeing holiday tutorials featuring a bright red lip and shimmering champagne eye makeup… so instead I went a little more 90s grunge and opted for a brown smokey eye and mauve-taupe lip. This eye makeup has enough shimmer, but enough boldness to offset an even bolder lip look. I recently wore this lip combination to an event and got so many compliments that I knew I had to recreate it, and why not for Thanksgiving? Follow along with the simple tutorial below. 1. With an eyeshadow primer, prime your eyelids. I’m using NYX Proof It Primer here. I find this lasts all day and is comparable to my UD Primer Potion. 2. Next, I’m grabbing my Make Up For Ever 15 Artist Shadow Palette for the entire eye look. With a flat shader brush, pat MUFE shadow i524 (Pinky Beige) all over your lid. 3. In your crease, blend in d826 (Fig), taking it to the outer corner of the lid. 4. Grab a fluffy blending brush to blend out Fig so to soften the look. 5. With a smaller precision brush, load up i662 (Amber Brown) and pat on the center of your lid, meeting the Fig shadow on the outer corner. 6. Then with this same precision brush, sweep Amber Brown across above the crease. Blend softly with Fig. 7. Next, grab a small brush and pat i528 (Pearl) into the inner corner and down the first half of the lower lash line. 8. With the same fluffy blending brush from earlier, blend Fig across the outer half of the lower lashline. Diffuse any harsh lines by blending with Pearl in the center. 9. Next, apply your favorite liquid or cream eyeliner. I used Stila Stay All Day Liquid Liner in Intense Black. 10. If you wish, apply lashes now. I’m using Ardell Natural 110s. 12. To finish off the eyes, blend your lashes with the falsies with a coat of mascara. If you skipped falsies, just apply your regular mascara. 1. Alright, now that the eyes are all done, let’s finish up the face! First I’m going to fill in my brows with my NYX Micro Brow Pencil. It’s not my holy grail, but is awfully similar to the ABH Brow Wiz but about half the price. 2. Next I’m applying my IT Cosmetics CC Cream in Fair. I like this because it keeps my skin pretty hydrated all day. If your family is full of shutterbugs, skip anything with SPF and opt for something like Make Up For Ever Ultra HD Foundation (splurge) or L’Oreal Infallible Pro Matte (save). 3. Since we’re going to have a long day, I’m sure to set my makeup, so I don’t look too dewy with Rimmel’s Stay Matte Pressed Powder in Transparent focusing on areas like the t-zone and under the eyes. 4. Then, I’m applying my favorite neutral blush – Tarte Amazonian Clay 12-Hour Blush in Exposed. It’s very similar to my neutral makeup favorite, Tarte’s Prim, which unfortunately was limited edition. 5. With the face all done, I’m going to focus on the lips. This lip look is going to have to make it through snacking, dinner, and dessert, so I’m starting it off with a lip liner. This one is Essence Lip Liner in 06 Satin Mauve. 6. Now I’m going to get a little fancy with the lip and apply a blend of two shades. The first is ColourPop’s Ultra Matte Liquid Lipstick in Kapow. This is a little dark for me as is, so I’m layering theBalm’s Meet Matt(e) Hughes Liquid Lipstick in Charming over the top. 7. I’m finishing off the entire face with a coat of L’Oreal Infallible Makeup Extender Setting Spray so that my makeup makes it through the long drive, dinner, and into the evening for a little shopping on the way home. Happy Thanksgiving! And now to give thanks for all of you who support me throughout the year, I want to share my favorite holiday makeup palette! I picked these up at the Sephora Friends & Family Sale and have been dying to use it for the holidays ever since. I mean, look at those colors! If you’re new to Make Up For Ever Eye Shadow, you’re in for a treat. These are almost a cream type consistency, which means they pack a punch when pressed directly on the lid. Enough about the palette, get to entering below! This is open worldwide and will end on 12/7 at midnight EST. So pretty! That lip color looks great on you! we are doing dinner with my family, and then dessert with his. tis the season! happy thanksgiving to you. Thanks b! Happy Thanksgiving to you as well! Aw, thank you Portia! Sounds fun. Happy Thanksgiving! We are celebrating with my husband’s family in his small town. I miss my family when we are there but it is a fun place to celebrate holidays! How fun! Happy Thanksgiving, Brooklyn! I’m cooking for a small dinner for my Husband, Brother-in-Law, Mother-in-Law and her Nurse. Aw, how nice of you! Happy Thanksgiving! We’re hosting my family this year. Quinn and I will make cake tomorrow and mashed potatoes and turkey on the day of. Thanksgiving night we’re going to my in-laws, where I don’t have to do a thing. Yay for not having to do anything at your in-laws! Happy Thanksgiving, Breenah! Going home to see family! Aw, sounds fun! Happy Thanksgiving, Meegan! I’m going to my mother in laws and which is great because she takes care of everything and even makes me special vegetarian food, love her! Aw, what a great mother in law! Happy Thanksgiving, Tara! I’m hosting Thanksgiving and then going out for desserts and drinks! Sounds fun, Julie! Happy Thanksgiving! I’m traveling up to snowy Michigan to spend Thanksgiving with all the family. Cannot Wait!! Sounds like fun Kim! Happy Thanksgiving! Wow!! This make up looks incredible on you!! Love that lipstick! I’m staying home and my mom is cooking thanksgiving dinner. Sounds fun! Happy Thanksgiving Colleen! All of my Dad’s side of the family have thanksgiving lunch at my aunt and uncles house in our small home town. It’s at least 60 of us that are able to be there. I so enjoy my family and that my daughters are home from college. I still can’t believe my Dads no longer with us, this is our third thanksgiving without him. The link to the first repin entry wouldn’t work for me. Has anyone had this problem? love this look on you! that lipstick is fabulous. Aw, thanks so much Kristen! Happy Thanksgiving! I’m just going home to my parents. Usually it’s a comfy and not so cute outfit with no make-up. However, this year I’m trying my hand with my tripod and new DSLR to take some holiday photos for cards, so I’ll have to actually wear make up and a dress this year! Thanks Kelly! ColourPop is great, I love their lip products! I am just having a Friendsgiving! I spent Thanksgiving with my family. We went to my husband’s aunt and uncle’s home. It was very nice. I just hung out with family and ate turkey! Ah, of course! Hope you have a great holiday season, and thanks for entering, Alexandra! We don’t celebrate Thanksgiving in my country, but I think we should always practice gratitude in our minds and souls ! This should be part of our everyday life. Thank you for the chance ! So very true! Thanks for entering, Bianca! What a fabulous palette! I love all of those colors! I spent Thanksgiving with my family eating a whole lot of food! Sounds fun! Thanks for entering, Michele! How fun! Thanks for entering, Shilpa! I had an early thanksgiving dinner with my family and then I had to work after. We don’t celebrate Thanksgiving in my country!I hope you had a great time! My grandma is coming in town for the hoildays. I’m spending a quiet holiday with my family. That’s a very nice look! Spending time with extended family is what I typically always do. Thanks Christina! Hope you had a great holiday and thanks for entering! Just a simple dinner with the family! I have 3 little ones and we have experienced a lot of changes this year so I am trying to make things as normal and as fun as possible. We are planning on going sledding, having breakfast with santa and looking at lots of fun xmas lights! Aw, that sounds like fun! Hope you have a wonderful holiday season, Amy! For the holidays we are spending it with family and friends at home. Hope you had a great holiday Michelle, and thanks for entering! I’ll just stay at home, sleep as long as I want without the alarm clock, eat as much sweet little cookies. Sounds like the perfect way to spend the holidays! Thanks for entering, Mai! I am visiting my hubby’s family this holiday. Hopefully we will just be hanging around the house and relaxing! Hope you had a good one Rachel! Thanks for entering! Taking our yearly trip from Michigan to Fishers IN. To visit our daughter, Kim!! Hey, it’s going south! Hope you had a great one, Sandy! Thanks for entering! Thanks for entering, Jessica! Hope you have fun! Me too! Thanks so much for entering, Monica!